Are We Building Too Many New Homes In Tallahassee? Are We Building Too Many New Construction Homes In Tallahassee? The market for new construction homes in Tallahassee is more active than we have seen in the past ten years. Recently, a reader wrote in to ask if we were heading towards another housing bubble. Before I answer (in great detail and supported by a lot of graphs and data below), let's first take a look at the inventory of new homes for sale in Tallahassee. Our reader points out that new construction homes are being built all over the Tallahassee area, and he is concerned that we might be "over building" and starting the next housing bubble. Personally, I can understand his concern after seeing the fallout from the housing bubble in 2006. 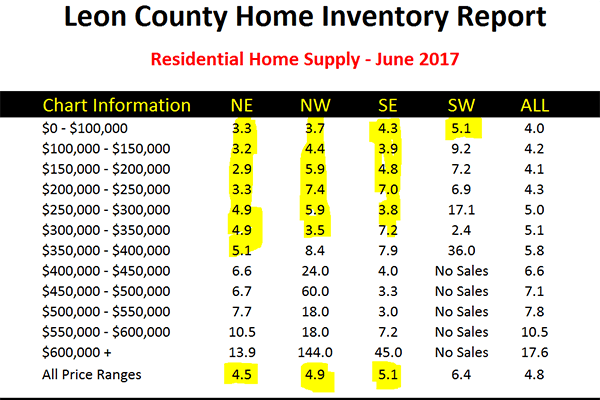 So, I think there is a logical way to approach pursuing this answer, and if you can bear with me for about a 5 minute read, you'll understand the market impact of new construction homes in Tallahassee as of mid-June in 2017. 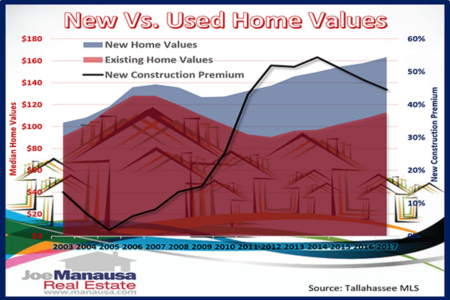 In order to determine whether or not we are in the preliminary steps of creating a new housing bubble, we first must take a look at the relationship between supply and demand for homes in Tallahassee. The following table shows the "months of supply" of homes for sale in the Tallahassee MLS. Note: 6.0 months of supply is considered a balanced market, numbers below 6.0 indicate a seller's market, while those above 6.0 indicate a buyer's market. What we are seeing in Tallahassee's supply of homes right now is a shortage in homes under $350K (on the North side of town) and homes under $100K everywhere. The number of homes selling is an important piece of this puzzle too. If home sales are on the rise, then increased demand indicates the potential need for an increase in the future supply of homes. Of course, as we discovered in 2006, the opposite it true too. The graph above shows that home sales were up 20% in May 2017 versus May 2016, and overall the market is up nearly 5% this year over last year. This means that demand for homes in Tallahassee is rising (but demand was still rising in early 2006 before the crash). So the next question I have is how sustainable is the current growth in the demand for homes in Tallahassee? 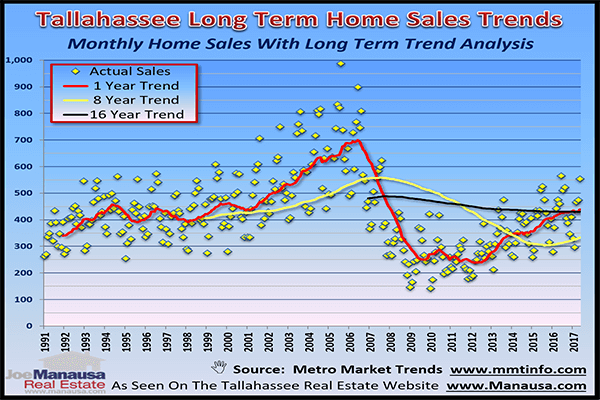 The following chart shows short, medium, and long-term trends for home sales in Tallahassee. The number of home sales recorded each month are plotted as yellow diamonds. The one-year trend (the average number of homes sold each month over the past year) is shown in red, the yellow line measures the 8 year trend, while the black line shows the 16 year trend. While I am not a true "chartist," I would say that the short term trend has passed through the medium trend and is now passing through the long-term trend. Most of the recent months totals are above the medium trend and many are above the long trend ... suggesting that there is plenty of upside remaining in this market. 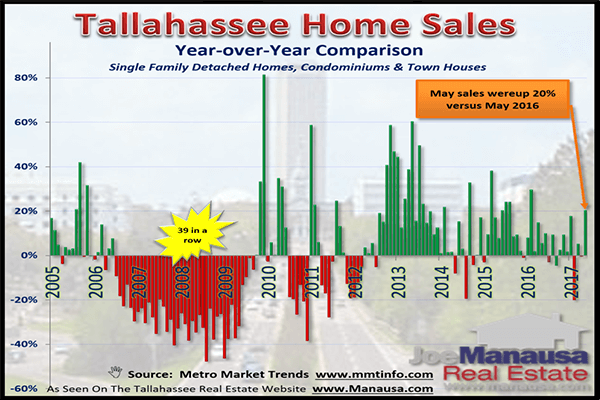 The graph above shows the total number of homes sold in Tallahassee through May of each year, going back to 1991. 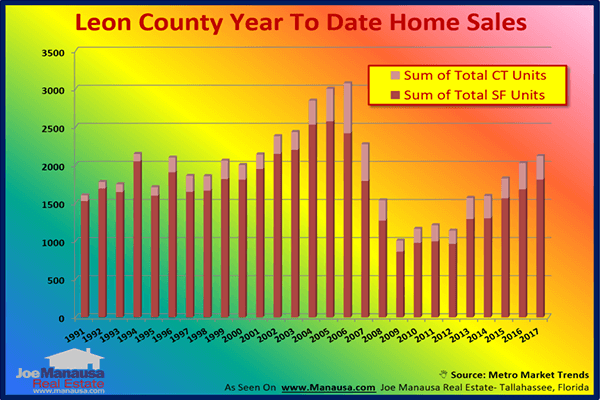 As you can see, this year is consistent with what was reported in 1994, 1996, 1999, 2001, and 2007 (meaning this is not an explosive year for home sales in Tallahassee). One must understand that our population growth (nearly 50% more people in Tallahassee than in 1991) suggests a need for more housing, and that need is likely consistent with the relative need for housing that we have measured in the past (meaning the ratio of homes to apartments and the number of people per household likely has not changed much over the long haul). In a nutshell, with this and other graphs I maintain, I perceive at least 20% more homes selling each month before we even being to worry about a bubble. But there are some "safety" checks we can make before we declare ourselves safe. 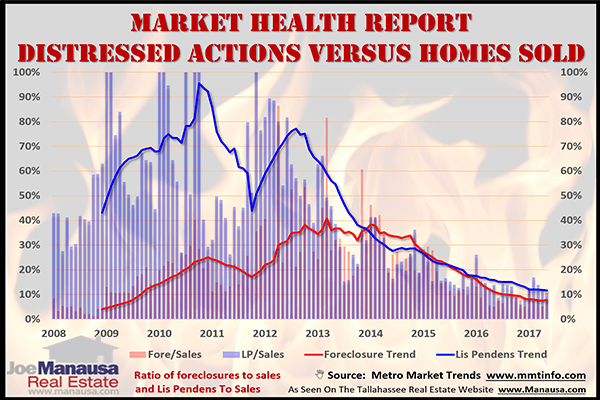 How Healthy Is The Tallahassee Real Estate Market? One way to measure health is to count the foreclosures each month and compare them with sales. After all, if a bubble is beginning to form, won't we get some warning from lenders announcing non-performing loans? The graph above shows the healthiest market report card that we have seen during the housing market recovery. The blue measures new lis pendens each month (the start of the foreclosure process), while the red measures new foreclosure sales each month. Both lis pendens and foreclosures are then reported as a ratio compared to the number of homes selling each month. In this graph, lower is better, and new filings are the lowest in ten years, while foreclosure sales have hit a seven + year low. From this, we can deduce that fewer people who are buying homes over the past ten years are ending up in default. This is obviously good. Should we see a turn upwards in the blue line, we'll know that trouble might be brewing. One final measurement we can undergo to ascertain whether or not a bubble is forming is to look at the relationship between new construction permits to new construction sales. If we see a large gap between permits and sales, then we know that unsold inventory is forming. 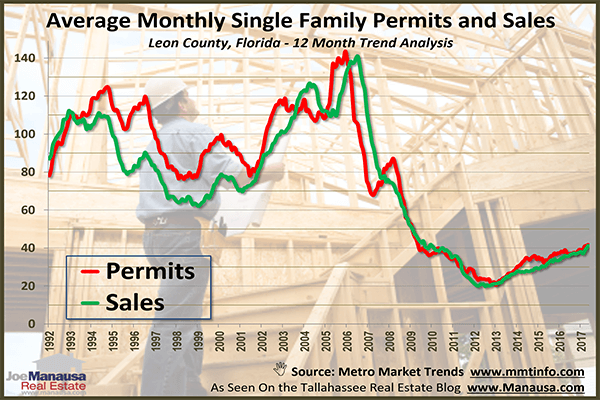 The average number of permits pulled each month is shown in red, while the average number of new homes in Tallahassee sold each month is shown in green. Look at the variances in the past, when permits out-raced sales and created a glut, and conversely, when sales out-raced permits and created pent-up demand and surging housing market. Right now, we're selling what we're building, even as we build more. This is a very healthy housing market, with upside demand HIGHLY likely, and low inventory in most price ranges to protect buyers who have to turn-around and sell for an unforeseeable reason. So my final answer to our reader is there is NOT a housing bubble forming right now, but I promise Joe Manausa Real Estate is staying vigilant and will report our findings here as usual. Don't forget to subscribe to the Tallahassee Real Estate Newsletter for a weekly update on the health of the Tallahassee real estate market, you can subscribe right here. The Tax Appraiser Doesn’t Care What Your Paid For Your Home! 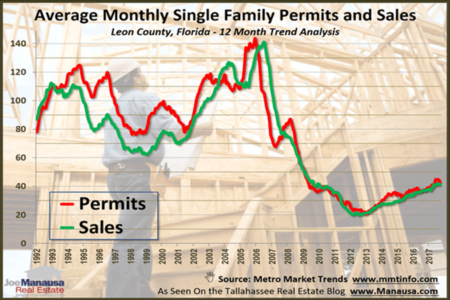 Will Tallahassee's New Home Construction Market Crash In 2018? What Must You Spend For A New Construction Home In Tallahassee?